It’s no secret that escape rooms are the hottest ticket in town right now. The mind-bending puzzles, the social element and the thrill of actually escaping are proving enormously popular. So what happens when you throw cutting-edge virtual reality technology into the mix? Here at Omescape, as well as offering traditional live escape rooms for anyone who fancies a challenge, we now offer a full VR experience. So what exactly is a VR escape game – and how does it differ from the escape rooms you might already be used to? Let’s take a look. A VR escape game follows the same process as a regular escape room. You’re trapped in a room, usually with some sort of theme, and you need to crack codes and solve puzzles in order to escape within a certain time limit. 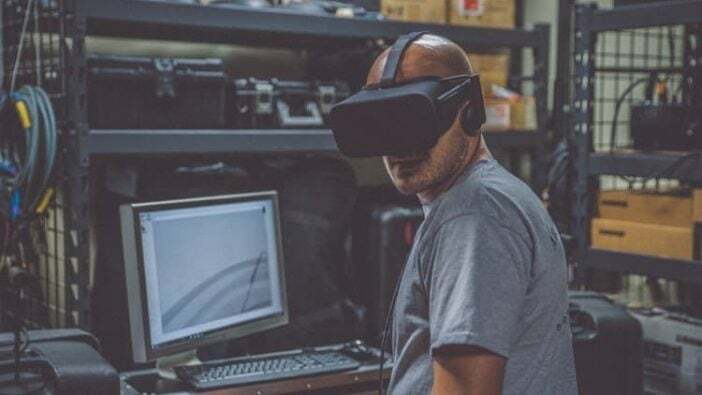 But with a VR experience, you and all your teammates will be wearing headsets, and you’ll be seeing and interacting with things that seem totally out of this world. The room you enter may look like a regular room, but once you don those headsets, you’re transported into another reality. It could be a science lab from the future, a serial killer’s lair, a private detective’s office or the vault of a global bank. The options are endless! VR escape rooms are even more immersive than the live experiences you may have already tried. Plus, they offer the opportunity to go to amazing locations and experience scenarios that wouldn’t be possible in regular escape rooms. Imagine looking out of the window in your escape room and seeing that you’re floating in space! Imagine you’ve just cracked open a locked door in a VR escape room, only to find there’s an undead zombie behind it! These are all exciting experiences that would be tough to create in real life – but in VR, there are virtually no limits. The premise is exactly the same as your regular escape game. You and your friends enter the room and put on your headsets. The game then begins, and you’ll all be able to see the same virtual surroundings as though you were actually there. Using our state-of-the-art headsets, you’ll even be able to use your hands to solve puzzles, instead of using a controller. So I can play with friends? Absolutely – in fact, VR is perhaps best experienced with friends! Our advanced room-scale tracking technology allows for up to six players in one room, so you can all work together to crack the codes and escape in time. What VR escape games do you offer? Our first VR escape game, Mind Horror, is now live. You and your team of cyber-detectives will be enlisted to enter the mind of a serial killer in order to find a kidnapped child. You’ll swim, smash, shoot and fly in this thrilling activity – but will you save the child before it’s too late? Want to give our VR escape room a try? Our ‘Mind Horror’ VR experience is ready for you to book right away.